As part of its design efforts, Google has finally updated the ugly Gmail sign in screen. Like the Docs changes [ see our story ], this feels cleaner and lighter. A gray bar stretches across the top of the page with a Google logo in the top left-hand corner -- no more Gmail logo with the envelope in the "m." The "Create an Account" button is now red and has been moved from below the sign in box to the top-right hand corner. The blue sign-in box has been converted to gray as well. To get the new sign-in page, look for a yellow box [ highlighted below ] at the bottom of the screen announcing: "Coming soon: A new sign-in page." 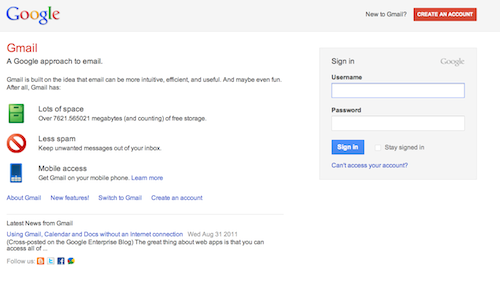 Earlier this week, Google made it possible to access Gmail offline. According to Email Marketing Reports, at the end of 2010 there were more than 193M active Gmail accounts -- behind Yahoo Mail (275M in May 2010) and Hotmail (355M in September 2010). In July, Google launched an "email intervention" program so people could tell their friends and family using Yahoo Mail and Hotmail to switch to Gmail.